In Congress, when they take out the heavy books and wall charts about Medicare, my thoughts go back to a house on Garfield Street in Janesville. My wonderful grandma, Janet, had Alzheimer’s and moved in with Mom and me. Though she felt lost at times, we did all the little things that made her feel loved. We had help from Medicare, and it was there, just like it’s there for my Mom today. Medicare is a promise, and we will honor it. A Romney-Ryan administration will protect and strengthen Medicare, for my Mom’s generation, for my generation, and for my kids and yours. 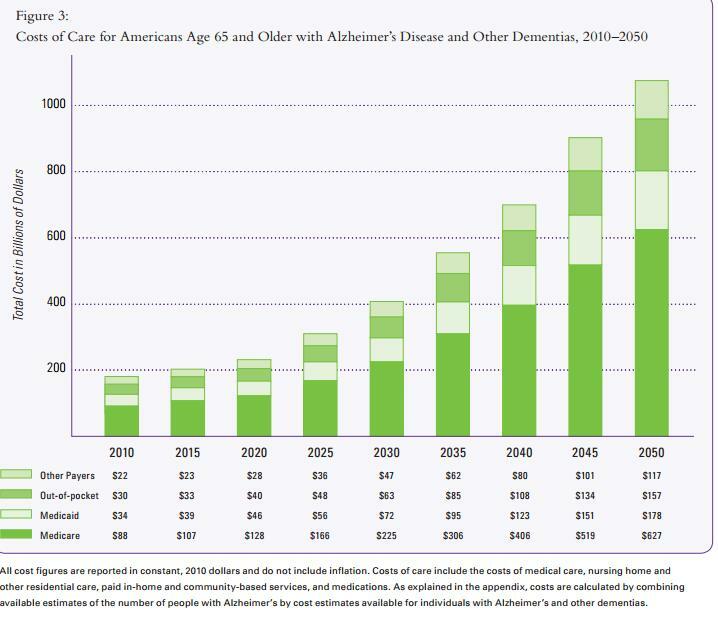 The chart above is from a recent US Alzheimer's Association report which shows the total projected cost of Alzheimer's care by major components including Medicare and out of pocket. It sure sounds like from his remarks above that Paul Ryan was promising to find all that money for Medicare and to cap per person out of pocket expenses. 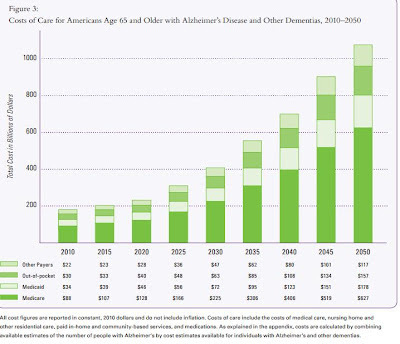 Yet Ryan's actually Medicare plan only indexes current costs to general inflation, ignoring the demographic and cost factors that drive diseases like Alzheimer's. Excuse me, President Morsi, but there is only one reason the Iranian regime wants to hold the meeting in Tehran and have heads of state like you attend, and that is to signal to Iran’s people that the world approves of their country’s clerical leadership and therefore they should never, ever, ever again think about launching a democracy movement — the exact same kind of democracy movement that brought you, Mr. Morsi, to power in Egypt. "We should all express our full support to the struggle of those who are demanding freedom and justice in Syria and translate our sympathies into a clear political vision that supports peaceful transfer (of power) to a democratic system," Morsi said in his opening statement. Morsi slammed Assad's rule, saying that the world had a "moral duty" to stand with the Syrian people in their struggle "against an oppressive regime that has lost its legitimacy." He said having a democratic system in Syria "reflects the desire of the Syrian people for freedom, justice and equality and at the same time protects Syria from entering into a civil war or being divided by sectarian clashes." The easy thing would have been to stay away and earn favourable headlines in the American media. Instead he showed up and told it like it was. Update: According to this Al-Arabiya story (easily run through Google Translate), Iranian state television provided a doctored translation of Morsi's speech, replacing Syria references with Bahrain, changing the name of Arab Spring to Islamic Awakening, and taking out references to various Caliphs (a theological issue). The debate is taking place because the euro area has not yet fully succeeded as a polity. Currencies ultimately depend on the institutions that stand behind them. When the euro was first proposed, there were those who said it would have to be preceded by a long process of political integration. This was because sharing a currency would imply a high degree of joint decision-making. Member countries would be a “Schicksalsgemeinschaft” and would need strong common democratic underpinnings. Who amongst us could have forgotten those times in 1990s when we were assured that the single currency would work because after all it was a Schicksalsgemeinschaft? Incidentally, the phrase means "community of fate." Further incidentally, does it seem like we need more German capabilities lately? The screen backdrop as Mitt Romney officially crossed the delegate threshold at what sounded like a sparsely attended nominating session in Tampa. Kolumnen von Zeitungsherausgebern und Online-Bloggern; offene Briefe von Professoren; am eigenen Interesse orientierte Analysen von Marktteilnehmern in Deutschland und weltweit: es fehlt nicht an Untersuchungen, Bewertungen, Szenarien von scheinbar unabwendbaren Katastrophen, und Ratschlägen, was „die Politik“, oder einfacher noch, „die Zentralbank“ doch bitte zu tun, oder zu lassen habe. It translates as: And we would have gotten away with it too if it hadn't been for you pesky bloggers. And professors. One of the stranger juxtapositions (see signpost) near the scene of the Empire State building area shooting in Manhattan today. Photo: Getty Images via Wall Street Journal. He could add to his list of free speech grievances that Samir Nasri was booked for his end of Ramadan festival (Eid) greeting to the Islamic world after he scored the winner in Manchester today. Assange: The following people are to be released from their captors: In Northern Ireland, the seven members of the New Provo Front. In Canada, the five imprisoned leaders of Liberte de Quebec. In Sri Lanka, the nine members of the Asian Dawn movement. Assange: I read about them in Time magazine. Saudi King Abdullah shakes hands with Iranian President Mahmoud Ahmadinejad at the Islamic Solidarity Summit in Jeddah -- even as they scheme against each other via a proxy war in Syria. 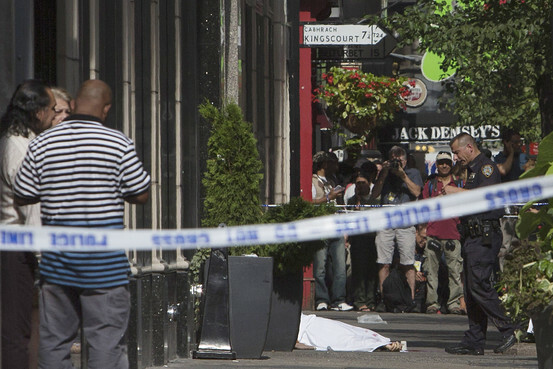 This New York Times photograph tells a story, or at least can have a story projected upon it. It's of two workers at a specialized valve factory in Frankfurt. The business is doing well and one reason it does well is because of the Euro -- many of its customers are abroad so it's a small business that benefits from the advantage of a common and/or "competitive" currency. But anyway, about the photo: two men, black t-shirts, one sleeveless, tattoos, earrings, tough-looking individuals. In any other country, they'd be typecast as "working class" with all those connotations. But it's Germany. They have a manual skill that's needed in a small business that's making money. So their entire life trajectory and prospects are different from what the class term implies. Meanwhile, Mitt Romney is popping up next to workers in overalls claiming that he's going to make their lives better, but that Europe is not the way to do it. And, more specifically, the Obama administration's weakening of individual incentives to work and produce by its sharp expansion of transfer payments can be reasonably viewed as retarding the U.S. economic recovery since the end of the recession in 2009. At what is now the explicit Romney-Ryan target of 4% annual growth, deficit reduction and fiscal stability would be achievable, and with much less pain and suffering. When I recently asked Mr. Ryan whether 4% growth was reasonable, he responded: "It should be easy. Under Reagan we had growth rates of 7% and even 8%." Reagan's Presidency had a single year of growth in that range -- 1984, after a brutal double-dip recession. Only Bill Clinton's years achieved the kind of growth that Ryan wants without a plunge at the start (Reagan) and/or the end (Bush). Both political parties have fallen victim to “partnership” with large and well-connected companies, especially in energy, housing, finance and healthcare. What rather significant chunk of government purchases from large private companies is missing from that list of sectors? Incidentally, we also want to suggest a logo for the Romney-Ryan campaign. UPDATE: With reference to our question above, it's worth noting that the announcement is being made in a naval base town, Norfolk Va., before an audience heavily populated with veterans. And going for the Irish ancestry as a working class credential, Governor Bob McDonnell doing the introductions referred to his grandfather from "Mayo County, Ireland." Is there any news outlet that did a story on American television network NBC not showing the men's 100m live which did not involve screen shots of tweets complaining that NBC did not show the men's 100m live? Russian flag carrier Aeroflot suspended all flights to war-torn Syria on Monday, citing commercial considerations. Aeroflot flights from the Syrian capital, Damascus, to its Moscow hub at Sheremetyevo Airport have been overbooked, while return flights have been practically empty, an unidentified Aeroflot spokesman told RIA-Novosti. Goldman Sachs Group Inc. agreed to buy the [erroneously purchased] stock in a bulk lot at a discount, causing Knight to record a loss on the deal. That loss was $440 million. Then again, as the firm's staff said to the themselves over the disastrous weekend arising from a software-induced trading error, it was all the fault of "One line of code."